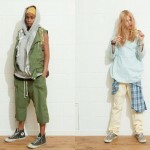 UNUSED, the Japanese-based menswear brand has showcased its dynamic spring / summer 2010 collection, and interestingly enough they’ve used female models for its lookbook. This UNUSED collection is fairly versatile and incorporates business attire, denim culture, cowboy elements (fringed messenger bags and western boots), but also infuses athletic wear as seen in the numbered jersey and diamond-patterned hoodie. This eclectic mix of styles and patterns (there is everything from stripes to plaid) along with the contrast created between the washed out khaki and gray tones and the vivacity of colors like yellow, is bound to make any man’s wardrobe funky, timeless and practical.